The Fourth National Climate Assessment identified the NJ Climate Adaptation Alliance as a key program to develop and implement climate adaptation strategies that assist Northeast municipalities, counties and states in efforts to build resilience to environmental changes and adapt to a changing climate (Chapter 18, Executive Summary). The NJ Climate Adaptation Alliance is co-facilitated by the Environmental Analysis and Communications Group at Rutgers’ Bloustein School of Planning and Public Policy and the Rutgers Climate Institute. The 4th National Climate Assessment was released on Friday, November 23, 2018. Learn more about the NJ Climate Adaptation Alliance here. 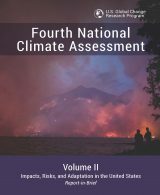 Access the Fourth National Climate Assessment, Chapter 18 here. Slider and post images from Fourth National Climate Assessment.